CyberStrong eliminates manual processes, provides the most efficient plan of action for every project, and uses credible risk data to measure team-wide success. Compliance and risk teams can prove that they are doing everything possible to adhere to best practices and mitigate risks at the speed of regulatory change and other compliance requirements. Future-proof compliance, eliminate redundancy, and scale down on manual effort. It’s simple. Manual effort slows projects down and security teams shouldn’t be slow to assess the risks of any asset. Get out in front of potential threats by automating assessment data collection, aggregation, reporting, and workflow. See when real-time threats emerge and how they impact controls live in your assessment environment and align with an "always on", continuous approach. With the fastest time-to-value available, use CyberStrong in just minutes to set your targets and get up and running on any assessment in hours or even minutes. Increase team-wide agility with workflow automation, notifications, due date scheduling and tracking that empowers rapid execution and goal achievement. 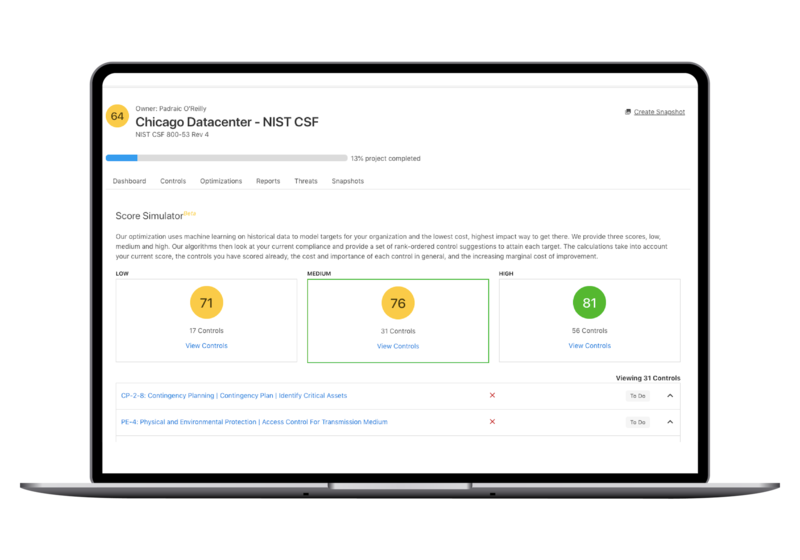 Make cybersecurity assessments an all-hands, no hassle effort by embracing the simplicity and speed that CyberStrong brings. Create alignment and understanding across both security and business units by linking risks to business impact, making assessments less stressful, more productive for everyone and even more enjoyable. Utilize CyberStrong's automated Risk Assessment Report, Plan of Action and Mitigations, and System Security Plan which are exportable with one click and require no human interaction to create. An Assessment Summary Report, Assessment List Report, Standard Risk Report, Trend Report, and Executive Risk Report and GDPR Report are also automated for review at anytime. Use compliance measurement and risk quantification to start the conversation with management about your progress, targets, and goals. Having an assessment level view of how you have lowered risk overall is critical to communication success. CyberStrong automates these dashboards as you walk through your assessment. From smarter insights to smarter actions, CyberStrong's proprietary AI and Machine Learning technology augments and enhances every element of your cybersecurity program strategy, posture, and potential. Built upon the NIST Cybersecurity Framework, CyberStrong is the rock-solid foundation for scaling your business securely. Have confidence that your GRC activities will only grow more efficient and effective as cybersecurity requirements increase. Beautifully designed with the fastest implementation available and unparalleled usability, CyberStrong automates the manual compliance and risk assessment processes making your program strikingly simple, measurable, flexible, and easy to manage. CyberStrong is built by Global CISOs, analysts, assessors, renowned technologists, and business leaders. From the White House to IBM, Dell EMC, MIT, KPMG, and more, we've been in your shoes. We know you want better, faster, easier — and we have you covered. A free collection of cybersecurity risk and compliance content to get you started. Adopting the NIST Cybersecurity Framework can be difficult. Here's a webinar on how to simplify adoption - by a CISO for CISOs. Learn how to optimize, augment, and automate your next compliance or risk assessment for increased efficiency. Do you sell to the Department of Defense or are you planning on expanding into the federal space in the future? You must be DFARS compliant. Learn how with our ultimate DFARS guide. Read the article on how to sell cybersecurity to your executive team. Originally written by CyberSaint for CSO Online Magazine. Get an in-depth look into how CyberStrong uses artificial intelligence and machine learning to deliver real-time, actionable insights into risk reduction. Looking to Align with the NIST Framework?